Swabhavi Agarwal did her schooling from St Josephs Academy, Dehradun. After that she went on to study Architecture from Chitkara School of Planning & Architecture. She is working as an architect since 2013. The action or skill of using paint, either in a picture or as decoration. "I did my Schooling from St Josephs, Dehradun. I did my Graduation from Chitkara School of Planning & Architecture, Chandigarh. After that I did my Diploma in Fine Arts. I have been working as a freelance painter since 2007." 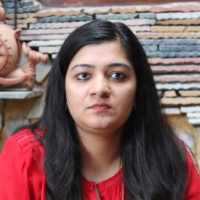 "After completing my schooling from St Josephs Academy, Dehradun, I went on to do my Architecture from Chitkara School of Planning & Architecture, Chandigarh. I have been working as an Architect since 2013."